I don’t know about you, but I know the enemy comes right before breakthrough to hinder, frustrate, distract, and to get you to operate in fear. The devil is a liar. Let me tell you, brothers and sisters, God raised my husband from the dead, healed him through two open-heart surgeries, healed him from two strokes…and he is still alive. (The full account is in my second published book: A LEAP OF FAITH (25 Days At The Mercy Seat). Jesus is alive and He is seated at the right hand of the Father God, interceding for us that our faith will not fail. You pull yourself up, raise your hands high toward the heavens, and declare the Word of God with me now. Get up on your feet and praise the God of Heaven and Earth, the Creator of All! He wants to raise you up to represent Him in the earth! God honors His Word and it is Resurrection time! I thirst for you, my whole being longs for you, in a dry and parched land where there is no water. I have seen you in the sanctuary and beheld your power and your glory (Psalm 63:2)…. One Sunday morning during worship, the Holy Spirit opened my eyes to see the Lord walking in the sanctuary, clothed in a cream linen cloak. The Spirit spoke to my heart to sit down, right in the middle of worship, and to read Psalm 63:2. When I read it, I knew God was confirming what He just allowed me to see. That is the amazing love of our Heavenly Father. So if the devil is raging, and the attacks seem relentless, know this; God is on the throne and He is for you, not against you. Stand strong and prophesy what God says about you and over your circumstances. Because your love is better than life, my lips will glorify you. I will praise you as long as I live, and in your name I will lift up my hands. On my bed I remember You; I think of You through the watches of the night. Because You are my help, I sing in the shadow of your wings. A LEAP OF FAITH (25 Days At The Mercy Seat)….the full account of God raising my husband from death and healing him….the story will keep you turning the pages. GOD’S PRICELESS TREASURE (How To Overcome Challenges, Be Transformed And Know Your Purpose)…..move from drama to destiny by turning to God. THE MIDNIGHT HOUR (Will America Turn Back To God?)…. a must read for every Pastor, leader, and family. 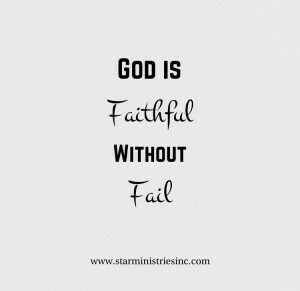 Who is faithful without fail? Did you know that the LORD is always faithful? He is…and always without fail, He will follow through on what He tells us. Though there may be times of delay and waiting on our part, and times when our earthly eyes have a hard time spotting Him working behind the scenes, and in our day-to-day lives, He is always there. God has promised to be faithful to His children..and He is! The Holy Spirit of God wants us to encourage ourselves in the Word and press onward. Live in hope for your future and all the beauty that is ahead. Expect to see God’s hand at work, watch for, and listen intently to hear His Voice. Hold on to your expectations and don’t give in to the temptation for temporary things.…what you see now…or even your current circumstances. Keep your eyes fixed on the future hope that eternal life provides. 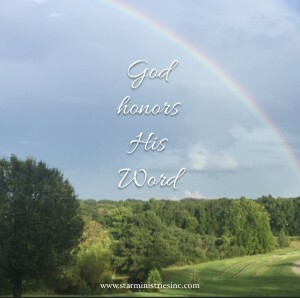 When you find yourself struggling with doubt, unbelief, people or circumstances, use your voice to declare God’s Word over you and your circumstances. God is good and He is always faithful. Keep your eyes fixed on God and the promises He has made. Rest in that knowledge right now. “Let us hold firmly to the hope that we have confessed, because we can trust God to do what He promised” (Hebrews 10:23). “You are the only God to be worshipped, For there is not a more secure foundation to build my life upon than you” (Psalm 18:31). People will fail you, disappoint you, betray you, and walk away…but God is always faithful. Choose to declare God’s Word over your circumstances instead of rehearsing what is happening or what has happened. Expect God to show up and to deliver on His Promises! He is always faithful. What a blessed truth to keep in our hearts always and forever. 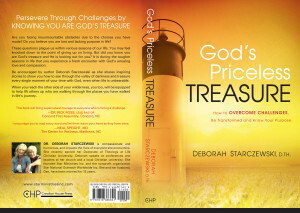 GOD’S PRICELESS TREASURE (How To Overcome Challenges, Be Transformed And Know Your Purpose)…move from drama to destiny, a test to a testimony, tragedy to triumph. A LEAP OF FAITH (25 Days At The Mercy Seat)…the full account of God raising my husband from death, two open-heart surgeries, healing from two strokes and 25 days in Mercy. You won’t be able to put the book down…..the amazing ways God moves will keep you turning the pages…and give you hope to believe for YOURSELF. THE MIDNIGHT HOUR (Will America Turn Back To God?)…. a must read for all. Available on Amazon, Barnes & Noble, www.starministrieisnc.com and other distributors.